Generally, most of iPhone users have received some important Text messages from lover, co-worker or friends. As it’s unsafe to keep them on iPhone, many people would like to backup these messages in case of mistakenly deleted or accidentally lost, such as iOS update, jailbreak failed, iPhone broken, or iPhone lost. This article lists three methods to Backup iPhone messages, you can select the best one to save your message to computer. Opening the Settings menu on your iPhone. Tap “iCloud” and log into your account. Scroll to the bottom of the iCloud menu and tap “Storage and Backup.” Switch on iCloud Backup. Your iPhone will need to be connected to Wi-Fi and plugged into a power source before it will begin the automatic backup process. Your iCloud account will store a copy of your iPhone’s data, including SMS messages, which can be restored onto a reformatted or new iPhone. You have only 5 GB of free iCloud storage, you can’t backup to iCould if you don’t have enough space. As both iTunes and iCloud can’t allow you to view the text messages. 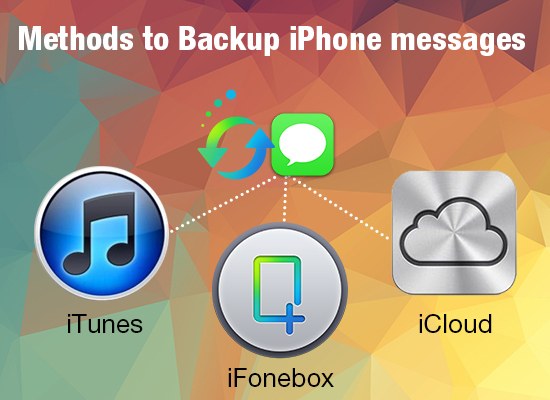 If you’re just interested in backing up only SMS, iMessage text messages to PC, Mac computer for later reading and safe keeping, how can you backup text messages on iPhone, and is there a way to backup text messages on iPhone freely and quickly? This entry was posted in Tips and Tricks and tagged Backup iPhone Messages, copy iPhone message to computer, save message to computer, view messages in backup by IosdroneD. Bookmark the permalink.